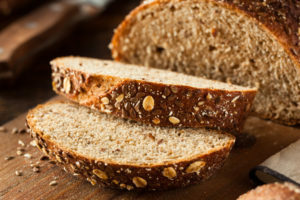 You know whole grain has more nutritional heft than white, bread, but can you choose between whole wheat, multi-grain, seven-grain, 12-grain, all natural, organic and enriched? An expert guides you down the bread aisle. Whole grains are also rich in protein, fiber, B vitamins and many other nutrients that help to lower blood pressure, reduce gum disease, strengthen the immune system and control weight. 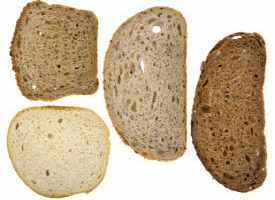 Most other breads are made with grains that have been finely milled. The resulting flour is whiter and lighter — in more ways then one! Not only does this refined flour look whiter and bake fluffier, it also falls short of many of the nutrients essential to optimum health. Whole grains begin as a whole grain kernel: bran, germ, endosperm. The milling process mechanically removes the bran, which is the fiber-rich outer layer of the grain. It contains B vitamins and other minerals. Milling also removes the second germ layer, which is rich in Vitamin E and essential fatty acids. In the end, what’s left is the starchy center, which is ground into flour for various baking purposes. Not only does refined flour lack all of those wonderful nutrients, high-starch foods like white bread can quickly raise your blood sugar levels, putting you at risk for diseases like diabetes. That’s why you should consider nothing but the best: 100 percent whole wheat or whole grain bread.